Molecular Biology of Hepatitis C Virus, M. Thomson and T.J. Liang. Hepatitis C: Viral Markers and Quasispecies, J.-M. Pawlotsky. Hepatitis C Virus Genotypes, P. Simmonds. 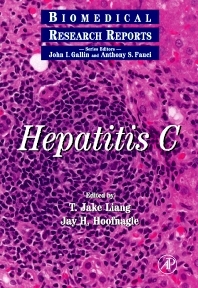 Acute Hepatitis C, J.H. Hoofnagle. Natural History of Hepatitis C, L.B. Seeff. Pathology of Hepatitis C, D.E. Kleiner. Humoral Response to Hepatitis C Virus, A.J. Weiner, D. Chien, Q.-L. Choo, S. Coates, G. Kuo, and M. Houghton. Immunopathogenesis of Hepatitis C, B. Rehermann. Epidemiology of Hepatitis C, M.J. Alter, Y.J.F. Hutin, and G.L. Armstrong. Worldwide Prevalence and Prevention of Hepatitis C, D. Lavanchy and B. McMahon. Therapy of Chronic Hepatitis C, J.G. McHutchinson and J.H. Hoofnagle. Hepatitis C and Cirrhosis, G. Fattovich and S.W. Schalm. Hepatitis C and Hepatocellular Carcinoma, A.M. Di Bisceglie. Hepatitis C and Liver Transplantation, M. Berenguer and T.L. Wright. Mixed Cryoglobulinemia and Other Extrahepatic Manifestations of Hepatitis C Virus Infection, V. Agnello. Hepatitis C Virus and Human Immunodeficiency Virus Coinfection, M. Ghany and D.T.-Y Lau. Hepatitis C and Renal Disease, S. Zacks and M.W. Fried. Chronic Hepatitis C and Porphyria Cutanea Tarda, J.R. Bloomer. Hepatitis C Virus Infection and Alcohol, J. Everhart and D. Herion. Hepatitis C in Children, M.M. Jonas. Hepatitis C and Pregnancy, A.E. Semprini and A.R. Zanetti. Hepatitis C and Iron, J.K. Olynyk and B.R. Bacon. Complementary and Alternative Medicine in Hepatitis C, D.B. Strader and H.J. Zimmerman. Development of Novel Therapies for Hepatitis C, J.Y.N. Lau and D.N. Standring. Hepatitis C Vaccines, S. Gagneten and S.M. Feinstone. Index. The anticipated encore volume of the Biomedical Research Reports Series, Hepatitis C is the first book that offers comprehensive and up-to-date coverage of this "silent epidemic." The subject matter ranges from basic science to clinical medicine, with contributions from more than 30 international experts in the field. This important new book details the hepatitis C virus and the disease that it causes, including its prevalence, means of spread, symptoms, complications, natural history, prevention, and therapy. The editors, T. Jake Liang, M.D., and Jay H. Hoofnagle, M.D., are both hepatologists and clinical and laboratory researchers who are well known leaders in the hepatitis field. Their team of authors provide the latest information on key issues such as the role of hepatitis C in liver cancer and evolving therapy for hepatitis C, including special subgroups of patients such as children, patients with renal failure, patients undergoing liver transplantation, and patients with HIV coinfection. The book also addresses future directions in antiviral therapy of hepatitis C and the real challenges of developing a vaccine. Hepatitis C is the integrated reference book for all researchers, clinicians, and students dealing with this troubling virus. Infectious disease specialists, virologists, gastroenterologists, and hepatologists. National Institute of Allergy and Infectious Diseases, National Institutes of Health, Bethesda, Maryland U.S.A.
T. Jake Liang, M.D., is the Chief of the Liver Disease Section, Digestive Disease Branch at the National Institute of Diabetes and Digestive and Kidney Diseases at the National Institutes of Health in Bethesda, Maryland. Jay H. Hoofnagle, M.D., is the Director of the Division of Digestive Diseases and Nutrition in the National Institute of Diabetes and Digestive and Kidney Diseases at the National Institutes of Health in Bethesda, Maryland.